Harper Lindquist is about to marry Ethan Hainstock and if you read book one you know all about everything they went through to get to this point. The renovations for the new lodge are well under way and Harper’s sisters Maggie and Scarlet have agreed to spend a few months at the lodge to help out. This is Scarlet and Cameron’s story. Cameron is Ethan’s brother and an alcoholic that has been sober for three years thanks to his love for his five year old daughter Tessa. His meeting with Scarlet did not go well since he has very strong feelings about his brother’s marriage to Scarlet’s sister. His brother was once before used and hurt by a woman after his money and now he is about to marry a woman he has only known for a short time. When he voices his opinions to Scarlet she is less than pleased. Scarlet has taken a leave of absence from his job in Chicago to help get word of the new lodge out to the public but she has a secret that she has been living with since she was eight years old, a secret that she never shared with her sisters or anyone else. The day her parents drowned she snuck up to where they were talking and overheard her mother announce that she was in love with another man and no matter how much Scarlet’s father begged she would not give in. Her father stated that he would rather die than live without his wife and when they discovered her listening they sent her on her way telling her they loved her. 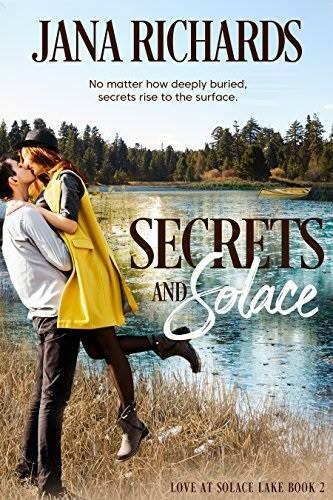 Her parents went into the canoe out on the lake for privacy and Scarlet has never stopped blaming herself for that since it was because of her eavesdropping that led them to go in the boat. She has had two broken engagements and is convinced that being in a relationship and finding love is not in the cards for her a feeling that Cameron also lives with. He knows he is a drunk and knows that he could slip at any time. He also was hurt by Tessa’s mom who he believed loved him but who took off with his daughter leaving him behind. It was that reason that he relocated to be near Tessa but always lives with the fear of what Laura his ex might do again. In time both Cameron and Scarlet begin to have feelings for each other but their pasts hold them back from fully commiting. The walls they have built around themselves seem impossible to knock down. Scarlet loves Tessa like her own and she risks losing both a chance at being with Cameron but also a chance at being with Tessa.